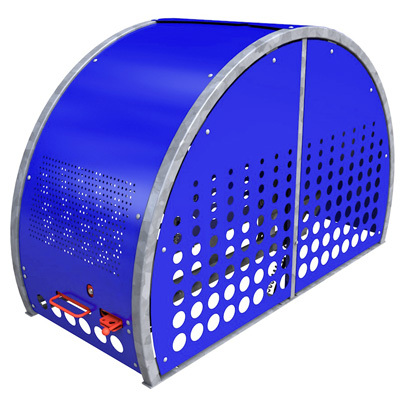 The Dero Veloport™ is an attractively designed bike locker, ideal for long-term, secure bike parking. Its unique curved form is fully enclosed and offers double the security with a lockable, interior bike tray and u-lock/padlock or keyed options for the door. The graceful lines and modern laser-cut design makes this locker stand out, while still offering the security and durability needed in long-term bike parking. Dero is proud to announce the Veloport™, a stylish, unique, modular bike locker. The graceful lines and modern laser-cut design makes this locker stand out, while still offering the security and durability needed in long-term bike parking. Its unique, curved form is fully enclosed and offers double the security with a lockable, interior bike tray and u-lock/padlock or keyed options for the door. Its curved door smoothly rolls up and down, opening and closing with the help of a lift assist system. View the Veloport video here. 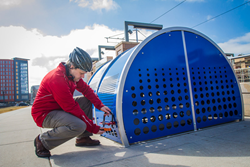 The Veloport is bike security at its best and is ideal for long-term bike parking applications such as at transit hubs, college campuses, government centers, and airports. The laser cut holes on the font and side panels not only provide a unique look, but help with ventilation and offer site lines for high security settings. The interior tray guides bikes into position and offers a second layer of defense against thieves. The Veloport is a single-sided, modular system, accommodating one bike per unit. Its frame is galvanized steel with the top and side steel panels available in numerous powder coat colors. Numbered plates and a fat bike compatible tray are also options. Installation is simple, with assembly onsite with security bolts. The Veloport also ships flat to save on freight.